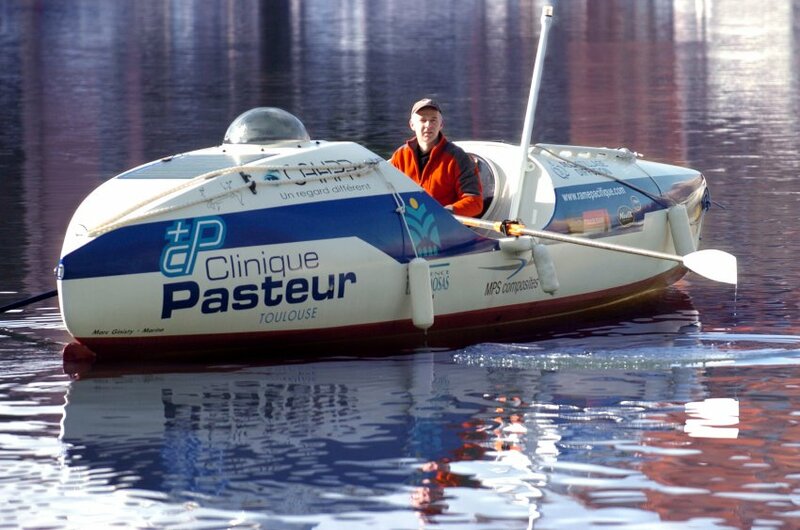 On 10 May, Serge Jandaud — a cardiologist at the Pasteur clinic in Toulouse — will attempt to row single-handed across the Pacific from Lima (Peru) in the east to Brisbane (Australia) in the west. He hopes to complete his epic 15,000 km journey in 210 days and will carry two Argos transmitters, supplied by CNES. Serge Jandaud sets off for Australia on 10 May. Credits: La Dépêche du Midi. 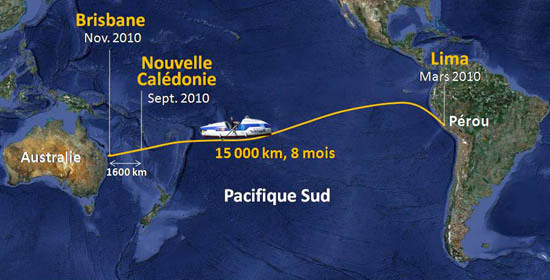 Toulouse-based doctor Serge Jandaud is making final preparations for a long voyage: a solo unassisted row across the Pacific. In addition to vital equipment, his unsinkable boat will carry two Argos transmitters. Developed by CNES since 1978, the Argos system locates transmitters anywhere on Earth, to within about 150 metres. Two transmitters are supplied by CNES. “One will be stowed inside the boat, the other will be on deck, in case I capsize,” he explains. He will also carry an Iridium satellite phone, so he can stay in touch with terra firma. While both transmitters can send a distress signal if needed, the inside one also allows the doctor’s position to be tracked in near-real time. With a signal transmitted every four hours, it will be possible to follow his voyage via an interactive logbook on the Internet: www.ramepacifique.com. Serge will cover 15,000 km from Peru to Australia. Credits: Serge Jandaud. Serge Jandaud. Credits: La Dépêche du Midi. The ultra-high frequency signal from the Argos transmitters is relayed via satellite to a receiving station, then sent to the CLS data processing centre in the Toulouse suburb of Ramonville, where it is analysed. The satellite phone, linked to the Iridium constellation, allows Serge to touch base every day and also send e-mails, thanks to a data kit. “It’s a very slow connection though — about 2 kbytes/s,” he adds. Serge embarks on his epic voyage on 10 May. 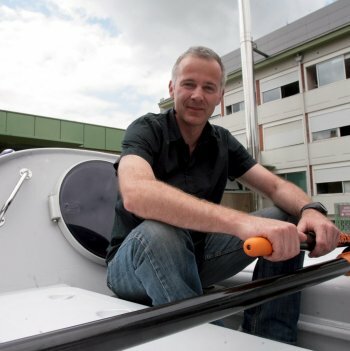 Not his first ocean adventure — he rowed solo across the Atlantic in 2006 — this is an entirely new challenge on a far greater scale. No stranger to natural phenomena, he knows he will face the Humboldt Current, which will push his boat northward, then the trade winds, which will push him west. His route will thus follow a long arc, which you can track in near-real time on his website, thanks to the Argos system.